is a group of individuals and families from all walks of life who are united in their desire to preserve the costumes, customs, and dances of the Bavarian mountain region of Germany. The letters B.G.T.E.V. stand for "Bayerischer Gebirgs Trachten Erhaltungs Verein", which means "Bavarian Mountain Costume Preservation Society". 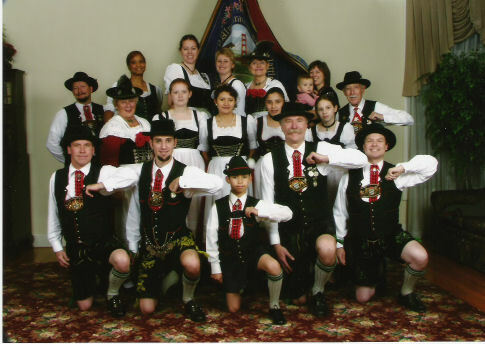 An Almenrausch is a small reddish-pink flower that grows in the Bavarian Alps, and Schuhplattler (literally, shoe slappers) are the knee-slapping/show-slapping Lederhosen-clad dancers. We heartily welcome all newcomers and beginners. You don't need a partner or previous experience; just bring a love of music, dance, and good times!